Issue #7 of Afterall will be turned into an exhibition featuring artists Kenneth Anger, Jeremy Blake, The Handsome Family, Jutta Koether and Richard Wright. This issue pivoted around the idea of the gothic as both the dark side (of artistic behavior) and complex visual patterning. 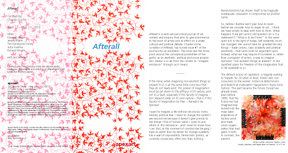 Afterall is a semi-annual critical journal of art, context and enquiry that aims to give prominence to the work of artists and its effect on a wider cultural and political debate. Charles Esche, co-editor of Afterall, has turned Issue #7 of the journal into an exhibition. The issue and the show pivot around the conceptual possibilities of the gothic as an aesthetic, political and social proposition. Below is a call from the curator to "imagine resistance" through such means. I want to imagine a life without structural, instrumental, political fear. I want to change the system I see around me because it doesn't give priority to the things I find of human value. I want to join others in this resistance – and I want to know how I can. But, at this moment of constructive longing, I have to admit that my desire for change suddenly hits a wall of impossibility. Democratic politics, as currently conducted, offers less than nothing. Revolution(ism) has shown itself to be tragically inadequate. Liberalism is compromise by another name. So, before I (before we?) plan how to resist… before we consider how to begin to act…I think we have simply to deal with how to think. What happens if we ask Lenin's old question (or is it a statement?) "What is to be Done?" in the same spirit but in the light of today. Self evidently, much has changed. We cannot take for granted the very things – trade unions, class solidarity and political possibility – that Lenin built his argument upon. Instead, what we may require of ourselves is, rather than a program of action, a way to imagine Spinoza's "non-existent things as present" in the qualified space for freedom of the imagination that is still available to us. The default victory of capitalism, a tragedy waiting to happen for 30 years at least, threw class-consciousness to the wolves. Historical determinism and dialectical materialism happened in topsy-turvy fashion. The past became the future. Except we already knew, even before 1989, that the future we had imagined was locked into the mass labor experience of factory work and trade union organization that had given it birth. In contrast, the present looks a lot more like the dark and exploitative underside of our own dreams of internationalism and free, non-alienated labor – dreams that we had long since relegated to a utopian neverland of imaginary world revolution. So, what ways are there to think resistance when there is no "organization of professional revolutionaries? "2 Even the active public space for discourse (the museum, for instance) has abandoned its foundational purpose to a privatized capitalist system that denies the public sphere while subsuming all private social activity into itself. As ever, the question is much easier to formulate than the answer – though let us understand the fact that for those who see the contradictions of capitalism in the wars it wages and the “third world” labor it employs, to have broad agreement that this is the question is an advance for emancipatory desire. The problem is that, however strongly desired, there is no existing political force or structure that could yet be imagined to articulate an answer. Or I cannot see one even on the horizon. certain artists. There are often overtly and unquestionably political works that tell us things about our fearful situation. But looking beyond the surface, another approach to the political becomes possible - an approach that adopts and adapts the aberrant, the obsessive, the darkness of the gothic to make its point about how an individual can put up some resistance to conformity and take a position in the world. The artists I refer to, some of whom are present in this show, keep themselves clear of manifestos, homilies or instructions. What they tell us in the end is the horrible, depressing, unconscionable truth that it is we (the collective of individuals, the multitude, the intellectual, immaterial laborers) who must try to shape the new forms of resistance or even ask the question "why?" To do this we have one imperious, uncontrollable tool – our imagination of "non-existent things." We can imagine our own resistances through the one product of humanity that privileges imagination – art. Art (of a certain kind) becomes the tool with which to imagine, and imagination becomes the tool to resist. Alain Badiou says "emancipatory politics always consists in making seem possible precisely that which, from within the situation, is declared to be impossible. "3 He is right, of course, but that impossibility, that is made to seem possible, can only come about through an act of free imagination and, as Spinoza teaches us, the truly free imagination is an act of deliberate self-deception. So, imagination, which is the thing upon which art has the greatest purchase, is finally delusional. To imagine resistance, which is what we now require, is to deceive ourselves knowingly, to choose to understand what may be decoration or decadence at other times as profoundly resistant of our current economic control system and political aggression. And the greatest benefit of all is that in that delusion, resistance again becomes possible and we can, in classic The Matrix vein, fight the monsters even when they are inside our heads.4 Only art can do this today, it seems to me, because only art has the permission to imagine without ridicule. The challenge, issued equally to artists as constructors and viewers as reconstructors, is to choose to imagine resistance through a picturing of something other than what is and to make use of those images in our lives -- in our intimate, specific, personal and public behaviors and choices. The mass media and the current democratic forums can’t help us get there. Probably they will be needed some day, if only to announce their abolition, but not now. What could be useful, perhaps, is the power of the imagination and art’s unique purchase on how it may operate in each one of us. 1. Benedict de Spinoza, Ethics, Prop. 17, http://www.msu.org/ e&r/content_e&r/texts/spinoza/ethics_part2.html#text18. 2. V.I. Lenin, What is to be Done, 1902. 3. Alain Badiou, Ethics: An essay on the understanding of evil, Verso, London, 2001. 4. The Matrix, 1999. Directed by Andy Wachowski and Larry Wachowski. of Afterall along with Mark Lewis and Thomas Lawson.